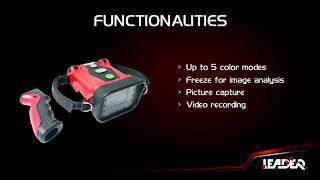 Leader TIC 3 and TIC 4 thermal imaging cameras have 1 or 2 removable batteries. Two batteries: 4 hours of use. 100% in 2h, 90% in 1h30 and 80% in 1h20 with a 110-240V mains charger. LiFePO4 batteries provide optimum security in fire operations. Compared to Lithium Ion batteries, LiFePO4 (Lithium Iron Phosphate) batteries are not dangerous when exposed to high temperatures (no explosion or gas emission up to 140°C). LEADER batteries are made of Lithium Iron Phosphate (LiFePO4), which gives the batteries an important heat resistance when firefighters intervene on fires and operate their cameras under high temperatures. This type of battery does not explode and prevents another accident to occur among rescuers. Moreover, its first objective of functionality is filled since LEADER batteries provide long-lasting autonomy and charge quickly! LiFePO4 rechargeable batteries (Lithium Iron Phosphate) designed for high T°C (no emission of gas up to 140°C, no explosion). To differentiate from Lithium Ion batteries that are sources of danger. 1 or 2 batteries can be used in the camera. 1 alone or 2 simultaneously. Charged in the camera using a conventional charger, or with the camera placed in a vehicle charging station, or directly with dedicated pads in the vehicle charging station if the option is available.